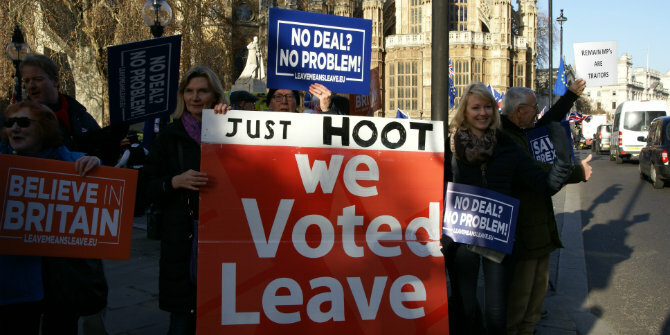 Recent votes in the UK Parliament prove that it is no more capable of agreeing where to go next on Brexit than the cabinet. As Theresa May creates the temporary illusion of party unity, a no-deal Brexit grows ever closer, writes John Ryan. However, the political fallout associated with the economic hit of No Deal – or any form of harder Brexit – should not be underestimated, he warns. The impasse in the cabinet, Parliament, and the country seems impossible of early resolution. Wise counsel advised an extension of time or other means but these may risk greater uncertainty and division. With such division it is very difficult to see how this reflects what some call “the will of the people.” Unfortunately this country lacks the leadership of certain great statesmen such as Franklin Roosevelt or Winston Churchill who were able eventually to carry public opinion with them through difficult times. Thus, historians may consider that sometimes it is not just a policy that is wrong but those who attempt to execute it. This post is pure Remain Central …..
… and in accordance with the Comment Guidelines about “strong criticism” I will explain why. The UK should seek to apply WTO Article 24, S5 (b) & (c) – which allows for ZERO tariffs while a Trade Agreement is being negotiated – for up top 10 years. Thus “business-as-usual” would be the default. Is there one entity called “the business community” ? Is that an academically rigorous assertion ? “Fear” may be just that – an unjustified emotion. a) Please explain where and how “the immediate disruption” comes from…. So if the people on the ground are going to be sensible – and seek “business-as-usual” …. who is going to order this “disruption” ??? b) “hard” border “unavoidable”. Why ? How ? If the Irish & UK Governments and the EU have all said “no new infrastructure” …. … from where is this fantasy “hard border “coming from? Who is ordering the materials ? Who will do the work ? The unsupported assertions keep coming ! What “economic hit” ? How much (in £) – and based on what assumptions ? A complete breakdown of trade flows ? What ? Thers is no such thing as a “hard” Brexit – let alone a “harder” Brexit. The ballot paper said “Leave” – clear, clean and unambiguous. “The political fall-out from not respecting the UK’s biggest democratic vote – should not be under-estimated” ?? b) Migration has hardly been an economic “good”. They ARE felt by every low income person via the increased cost of housing – anything from £1,000 to £5,000 p.a. depending on region. ….. And then there is the cost of overcrowded schools, delays in health care, slower journey times. So how has mass immigration helped productivity ? c) Why will British consumers be “forced” to buy more expensive imports? Especially when the UK can reduce the EU’s tariffs on food clothing and shoes. Doesn’t the author think this just a little insulting ? As for umpteenth assertion “hitting living standards”…..
Will poorer families object to cheaper food, cloths and shoes outside the EU’s protectionist tariffs ? Maybe a little more disposable income might relieve the pressure on the welfare state. Assertion ! How much is this “damage”? Presumably the auther has not read the economists who argue that EU membership imposes costs roughly 11% of GDP – and that leaving should remove some of these costs. Hopefully MPs will continue the trend towards understanding that “no deal – or rather WTO – as the more sensible option. The lies of Project Fear Mk2 have always left the starting block fast – and unchallenged by a Remain media …. – (optional) checks can be done inland. ….. that unshackling from the EU could be immensely beneficial. Why not “implementing the biggest democratic vote in UK history” ? In short my “strong criticism” of this piece is that it bears few hallmarks of a well-researched or evidenced academic piece. This is a figure from a UKIP “research paper” authored by Tim Congdon (a former UKIP candidate) in 2013. The calculation itself is based on multiple nonsensical assumptions such as an EU regulation cost of 5.5% of GDP, claiming there has been a direct cost to the UK economy from “lost jobs” going to EU immigrants, and that EU budget payments cost around 1.25% of GDP when the actual figure is closer to 0.5%. And no, I don’t expect most academics have read ludicrous papers like this one. I would suggest that if you think a serious “well-research and evidenced academic piece” should be taking politically motivated, intellectually bankrupt UKIP figures as a starting point then you’re not being very reasonable. Of course that’s fairly standard for these kinds of comments – railing against academic bias then quoting information almost exclusively from political campaign material that has about as much credibility as a chihuahua in a pair of glasses. Thanks for signposting to Tim Congdon’s piece. It was a refreshing read – acknowledging that there are many different figures from many different methodologies – and that it is hard to pin down “correct” figures. Even the Govt’s reporting of GDP has to be qualified as the “GVA” method. “EU budget payments” of ~£20 billion were clearly order of magnitude nearer 1 1/4%. Is your 0.5% the EU fans favoured “net” figure – after payments to the UK that the EU decides where to spend ? If you are going to assert that an “EU regulation cost of 5.5% of GDP is nonsensical” … at least have the courtesy to give a clue as to “why” – rather then trashing the author. As for your dismissing ” lost jobs going to EU migrants” … I have no idea what Congdon included …. but it seems pretty obvious if that some of the 3 million EU citizens send money “home”, then that money is “lost” to the UK economy – so “lost jobs” seems fair. Eurostat said that remittances by EU citizens from the UK were £ 5.3 billion – which was about 0.3% of GDP. Congdon’s research does not appear to cover the enormous higher housing cost from millions of extar people seeking homes. So maybe he understated the cost of EU membership !